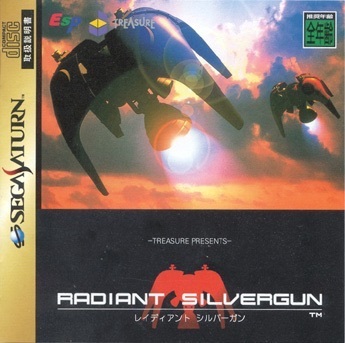 Radiant Silvergun (レイディアント シルバーガン is a vertically scrolling shooter video game, developed by Treasure Co. Ltd. It was released in arcades on the ST-V platform in 1998 and subsequently ported to the Sega Saturn, with added cutscenes by noted animation studio GONZO. The game was not released outside of Japan.The game is considered by many to be the pinnacle of the 'maximalist' school of vertical shooter design. It features a unique and innovative weapons system, with seven weapons available at any time. The player has three buttons to control the weapons; the weapon fired depends on the combination of buttons pressed.